Judy Ann Sadler. Illustrated by Susan Mitchell. He can't wait to look. 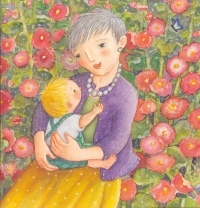 Judy Ann Sadler is already well-known for her popular children's craft books, and in this heart-warming picture book, she portrays a young baby enjoying the love of his large multicultural, family on a beautiful summer day. 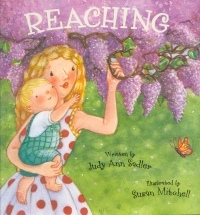 The book celebrates the action of "reaching" in a series of rhyming couplets as Dad reaches to tickle baby, Great Gran reaches for their favourite book, and Baby reaches for the moon and the stars. Babies and toddlers will enjoy Judy Ann Sadler's flowing language-her use of rhymes and repetition create a soothing melody to which young babies will respond. Susan Mitchell's bright, radiant watercolour illustrations bring the joys of getting to know a newborn baby to life and reflect the flow of Sadler's words. Her use of vivid colours and soft, rounded images conveys a warm summer day. Mitchell's pictures add depth to the story-her use of balloons, decorative flags, and presents suggest that it's Baby's birthday and remind parents to celebrate each day with their babies as they grow so fast. Sadler and Mitchell have created a warm, joyful picture book worth sharing with any new families. Meghan Radomske is a librarian at Guildford Library, Surrey (BC) Libraries.